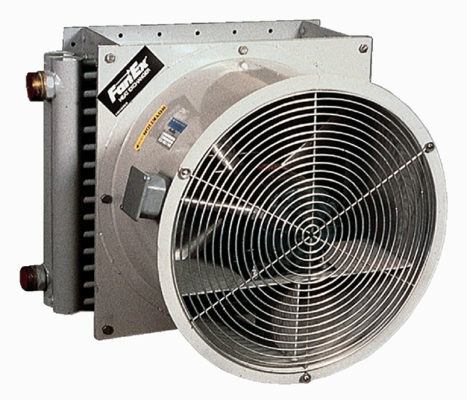 FanEx (Air/Oil) Heat Exchangers with Amaspher Turbulation have heavy duty direct drive fans, copper headers with brazed joints and galvaneal steel housings. All Air/Oil models feature exclusive, patented Amaspher turbulation to mix oil for better cooling in less space. Twelve standard sizes with oil flows from 2 to 180 gallons per minute. Materials: Aluminum Plate fins, 1/2″ OD Seamless Copper Tubes, Copper Headers, Galvaneal Steel Core Housing, Steel Motor Support. Other materials, such as carbon steel and stainless steel, available upon request. Above is standard motor data. Other motors available upon request. Applications: For cooling oil or other fluids with air, where compact size, cooling efficiency, safety and quiet operation are important. Amasphere turbulators to increase efficiency and reduce cooler size.